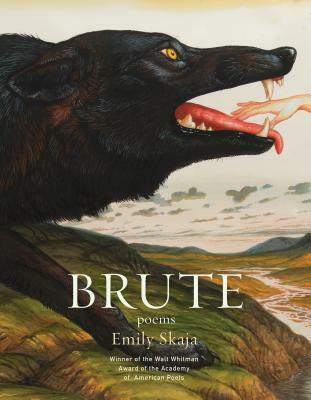 Emily Skaja’s debut collection is a fiery, hypnotic book that confronts the dark questions and menacing silences around gender, sexuality, and violence. Brute arises, brave and furious, from the dissolution of a relationship, showing how such endings necessitate self-discovery and reinvention. The speaker of these poems is a sorceress, a bride, a warrior, a lover, both object and agent, ricocheting among ways of knowing and being known. Each incarnation squares itself up against ideas of feminine virtue and sin, strength and vulnerability, love and rage, as it closes in on a hard-won freedom. Brute is absolutely sure of its capacity to insist not only on the truth of what it says but on the truth of its right to say it. “What am I supposed to say: I’m free?” the first poem asks. The rest of the poems emphatically discover new ways to answer. This is a timely winner of the Walt Whitman Award, and an introduction to an unforgettable voice. Emily Skaja grew up in rural Illinois and is a graduate of the creative writing MFA program at Purdue University. Her poems have been published in Best New Poets, Blackbird, Crazyhorse, FIELD, and Gulf Coast. She lives in Memphis, Tennessee.